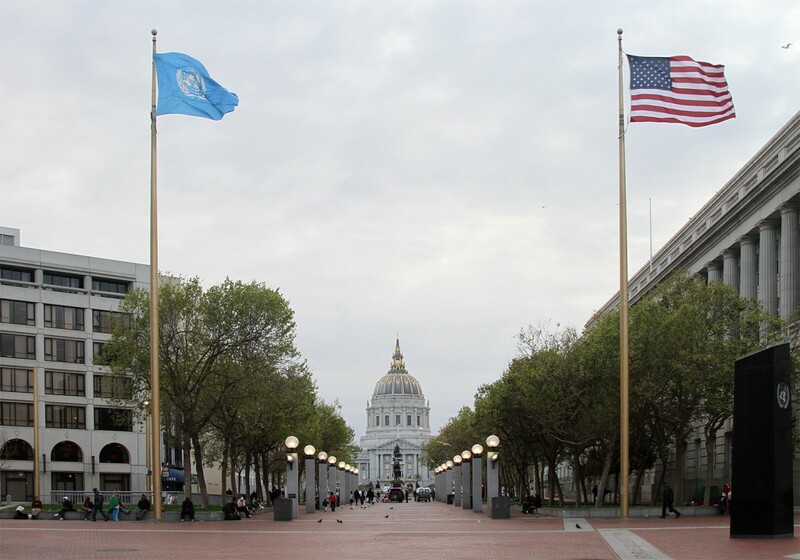 United Nations Plaza at the Civic Center, San Francisco, CA. This year marks the seventieth anniversary of the United Nations Conference on International Organization from April to June 1945. Although the war was still not won, delegates from 50 Allied nations gathered in San Francisco to create the UN Charter. They sought to create a postwar international system that avoided the mistakes after World War I and would prevent another world war from ever occurring. Twitter offers a unique opportunity to commemorate this anniversary by offering tweets in real time about the creation of the UN seventy years ago. The Twitter project will run until 2018 to incorporate other events such as the establishment of the World Health Organization (WHO) in 1948 or the inclusion of the International Telecommunication Union as a UN specialized agency in 1947. The Twitter account @UN_History gives followers a sense of the drama lying behind the birth of the UN and its agencies. It introduces them to less well-known participants such as Dr. Szeming Sze, who was instrumental in the foundation of the WHO. Historians and public history projects are increasingly turning to Twitter to provide a sense of history in real time. In Germany, a Twitter account, @Mauerfall89, traced the lead-up to the fall of the Berlin Wall. It attracted 13,700 followers by the time it ceased operation on November 12, 2014. Similarly, the British Foreign Office tweeted the build-up to World War I in summer 2014. The UN Twitter Project is part of a larger UN History Project. The UN History Project is a website that provides resources for those interested in teaching and researching the history of international organizations. It offers timelines and online sources for teachers on major themes in UN history along with extensive guides to online and offline archival material. There are also featured lectures by leading scholars and UN personalities such as Gro Harlem Brundtland, former Director-General of the WHO and currently Special Envoy on Climate Change for Secretary-General Ban Ki-Moon, and Amartya Sen, Nobel-Prize winning economist and co-creator of the Human Development Report. The history of the UN is rarely integrated into American history. Students generally learn about international organizations through participating in Model UN. But international organizations are intimately intertwined with the history of the United States. Some of the key founding conferences for the United Nations took place on American soil in 1944 and 1945. The US covered the expenses of the San Francisco conference in 1945 and was one of four sponsoring governments. (The others were the UK, USSR, and China.) The UN’s headquarters are located in New York, while the World Bank and International Monetary Fund sit in Washington DC. In 2010, the United States supplied 22 percent of the UN’s budget and was by far the single largest contributor. Some of the most important developments in recent history have emerged from the interaction between the United States and UN agencies. Smallpox was eradicated by 1980 thanks to collaboration between the WHO, United States, and the Soviet Union. Statistics collected by the UN provide much of the data for American political scientists and economists. The United States proposed the World Heritage Convention to UNESCO in 1972 and was the first state to ratify the Convention. Mesa Verde and Yellowstone National Parks were included in the first list of UNESCO World Heritage Sites in 1978. The World Heritage Convention spread the American concept of national parks around the globe from Simien National Park in Ethiopia to Sangay National Park in Ecuador. The seventieth anniversary of the UN’s foundation is a key moment to reflect upon the organization’s remarkable history. The Twitter account provides a short, snappy, and vivid narrative of the events as they unfolded in real time. It brings the UN into homes and offices around the world for a few minutes every day. Finally, it brings the history of the UN alive and vividly portrays the creation of UN agencies as a lived experience. Heidi Tworek is a lecturer on History at Harvard University. She is also the project manager for the United Nations History Project website (www.unhistoryproject.org).